Isolated ground (IG) receptacles (electrical outlets) are most often found in hospitals and other medical facilities, commercial buildings, and some industrial settings. This special receptacle may have an orange face with a small green triangle or a white face with a small orange triangle. The triangle is the official indication that the receptacle has an isolated ground. Isolated ground receptacles have special construction and wiring that help eliminate electromagnetic "noise" that can affect sensitive electronic equipment. They are very rarely installed in homes but sometimes are used in large installations to combat noise interference with audio, video, and computer equipment. With standard 3-slot grounded receptacles, the ground slots for both halves of the receptacle are electrically connected to the receptacle's ground screw. The circuit wiring has a ground wire that connects to the ground screw to complete the ground safety connection for the receptacle. 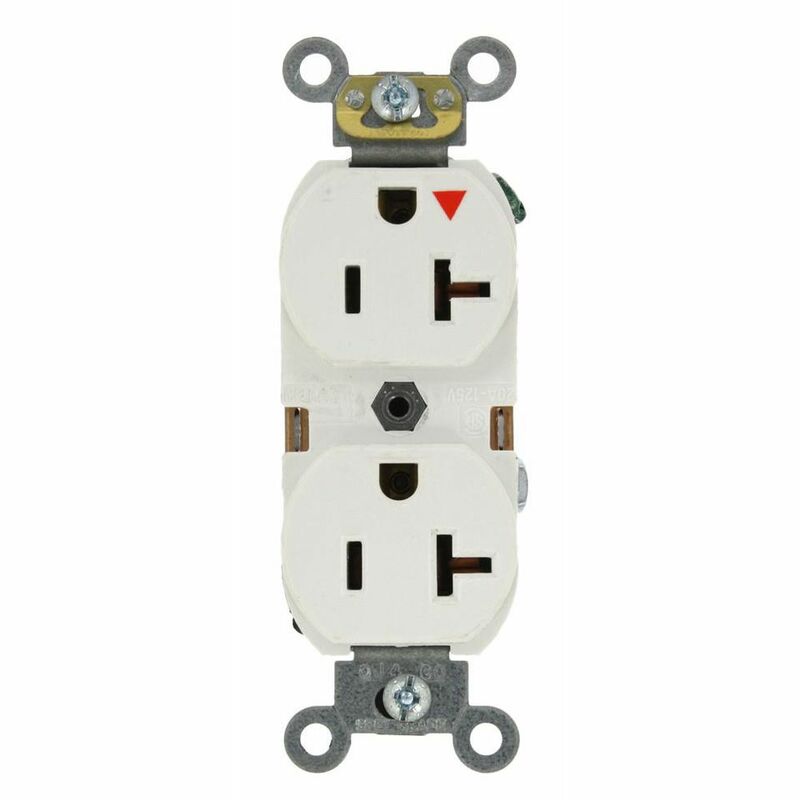 If the circuit feeding the receptacle includes metal raceway (conduit and electrical boxes), the receptacle also can be grounded to its box and the conduit via the two metal "yokes," or mounting ears, that connect it to the box. An isolated ground receptacle also has yokes and a ground screw, but the yokes are electrically isolated from the ground screw. Therefore, the ground screw and the receptacle body can be used for two separate ground paths. This separation isolates the receptacle slots from any noise present in the metal raceway. A basic wiring configuration for an IG receptacle starts with a 3-wire cable with a ground wire. The black hot wire connects to the brass-colored terminal on the receptacle. The white neutral wire connects to the silver-colored terminal, and the bare ground wire connects to the ground screw on the metal electrical box. The red wire is used as an isolated ground for the receptacle; it is connected to the receptacle's ground screw, then is marked with green phasing tape (at both ends) to indicate that it is a special ground wire, rather than a hot wire. In the electrical panel, the bare ground wire and the green-taped red wire both connect to the ground bus. Sometimes there is only a neutral bus in the panel, and this is bonded to the case of the electrical panel. This allows the neutral and ground connection to be at the same potential, making this connection a combination neutral/ground connection. If at all possible, though, a ground connection directly to the grounding bus, which is connected to a ground rod, is preferred. This special ground connection between the isolated-ground receptacle's ground connection and the electrical panel's grounding or neutral bus​ provides a dedicated ground path for electricity to flow without electromagnetic interference. Note: Many applications involving isolated ground receptacles include very specific installation requirements that may not be met by the simple example described here. You may be researching isolated ground receptacles to solve noise or buzzing problems with your electronics. But chances are, there are much easier remedies than installing a new circuit feeding an IG receptacle. For starters, most wiring in modern houses uses nonmetallic (Romex) cable and plastic electrical boxes. This creates an isolated ground system, and installing an IG receptacle isn't necessary. One of the simplest remedies to try is to plug all of the electronics that are interconnected (by AV cables) into a single power strip plugged into a single outlet. This eliminates the potential for a "ground loop" caused by plugging interconnected devices into more than one receptacle.